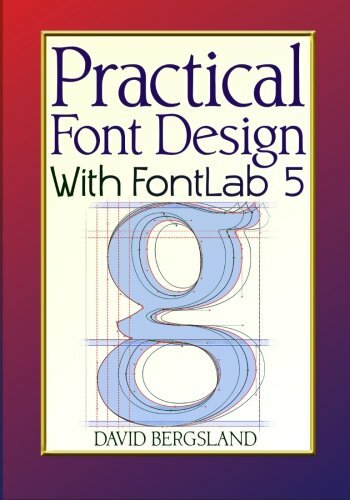 This is the final edition of Practical Font Design using Fontlab Studio 5. It shares and demonstrates the latest, most efficient, basic font production workflow for single fonts and font families. David has spent over twenty years refining his font design techiques. This book does not offer a lot of intellectual design help. This is focused on · "How the heck do I do this?" and · "How can I quit spinning my wheels?" and · "Why is this taking me so much time?" These techniques will enable you to enjoy font design by letting you focus on the actual drawing of characters with a clear plan and a workflow which does not get in your way. More than that, these techniques will enable you to control the consistency so your font works as a whole. The book will teach you what a companion font is and how to design one. It will teach you an easy letterspacing technique which will allow you to simply control whether you are designing a text font or a display font. The book is a wealth of tips and techniques shared over the author's shoulder as you watch him develop his fonts. He's not teaching his method, but showing you how to develop your method of working. The book develops fourteen fonts in four font families, focused on book design. These Librum/Bream families are available at MyFonts.com, fonts.com, linotype.com, fontspring.com, and through his website: bergsland.org The book will change your life as a font designer.